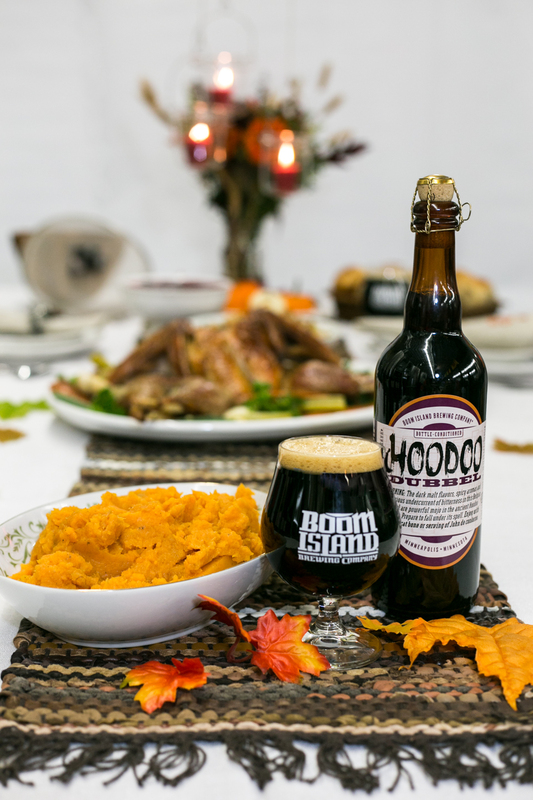 Our Third Thanksgiving pairing is Sweet Potatoes and Hoodoo Dubbel. Forget the marshmallows and pecans. Serve up these mashed sweet potatoes with a surprising twist! Hoodoo’s subtle spice and banana notes will sing when served alongside this dish. • Place the potatoes in a large saucepan and cover with 1 to 2 inches of cold water. Bring to a boil over medium high heat and cook potatoes until tender. Drain potatoes and set aside. • Return the pot to the stove top over medium heat. Add butter and bananas to the pot. Cook bananas 5 minutes and add the juice of 1 orange to the pot, reserve the zest. Allow the juice to cook out, 1 minute. • Add the potatoes to the pot along with the Hoodoo and brown sugar. Mash potatoes, banana, stock and sugar together until well combined. Season with nutmeg, salt, pepper and orange zest, to your taste.